The U.S. housing market has done very well over the past couple of years, but the rise in home value is expected to slow down or even reverse, especially in these 6 areas of the country. The U.S. real estate market has come a long way since the mortgage and foreclosure crisis. The national average home price has risen by about 27% since the lows of early 2012, and many markets have done even better. However, most experts are projecting the market to cool off considerably over the next year or so. 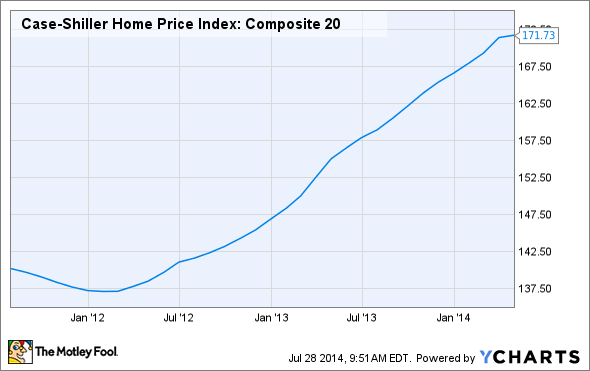 Many markets are projected to see gains of just a couple percentage points. And, many markets are expected to actually decline in value over the next year. According to Zillow, home values are expected to decline in 23 metropolitan areas in the United States, and if you want to see how your local market is projected to perform, check out Zillow's research here and download the complete Zillow Home Value Forecast data. Here are the 5 metropolitan areas where home values are expected to decline the most over the next year. If you were thinking about buying a house in any of these areas, you might get a better deal if you wait. The Ocean City Metropolitan Area includes all of Cape May County in New Jersey, and represents the southernmost coastal area of the state. The area has a fairly expensive market, with the average home worth about a half million dollars. New Jersey's coast, or "the shore" was hit very hard by Hurricane Sandy, and the recovery has made for a sluggish housing market. This relatively small metropolitan area is home to about 60,000 residents. Houma's market has rebounded strongly since the crisis, and may have come too far, too fast. In fact, the average home value in Houma is actually more than its pre-crisis peak. This area in central Virginia has a population of more than 200,000. Charlottesville actually has a fairly robust market, with far fewer underwater mortgages and delinquent homeowners than the U.S. average. However, the average listing price has risen more than 22% in the last 18 months alone, leaving the market due for a pullback. Cape Cod still has a ways to go to rebound from the housing crash, but it doesn't look like it's going to happen anytime soon. The area's home values are still well below the pre-crisis peaks, but after a strong performance in 2013, home values have already started to fall in 2014. Baton Rouge has a relatively inexpensive market with an average home value of $138,400. Home values in the area barely budged during the crash, but increased over the past few years along with most of the rest of the U.S. In fact, Baton Rouge home values are 5% higher than the pre-crisis peak. According to Zillow, Kingston has one of the least-healthy real estate markets in the United States. About 24% of Kingston's homeowners are underwater on their mortgage, meaning they owe more than the home is worth. And, 14% of all mortgages on Kingston homes are currently in some stage of delinquency. A flood of foreclosures is never good for home prices, and with such a high delinquency rate, it looks like Kingston is heading in that direction.